I fell in love with their pizza dough the moment I first laid my lips on Domino's Pizza. Their pizzas have that wonderful chewy texture which other pizza chains do not have. And, if you are like the Evilbean, who always orders food because his legs are not meant for walking (I wish someone will just carry me around so I don't have to ever walk), you will understand the frustrations when you are SUPER HUNGRY and the food you ordered takes forever to come. If you have ordered online or through its iPhone app, you would have seen its famous pizza tracker known as the.. erm.. Great Pizza Service Tracker. (QUITE A CUTE NAME AR DOMINO'S!) You can actually see the status of your orders, from the stage of making your pizza to when your order has left the store for delivery! Super neat! Do you know that Domino's Pizza actually have a restaurant outlet for you to dine in? In fact, there are 15 Domino's Pizza stores in Singapore! I guess nowadays, most of us just go online and order our food because we are just SO BUSY (or getting lazier). The event was held at their Kovan's outlet, which is beside Lola's Cafe if you have been there. We had an individual photoshoot when we entered so I tried my best to act like a model. Okay. Fail. I know. I need to sign up for some modelling classes to know how to pose and smile properly. Anyways, this was the first time I stepped into a Domino's Pizza restaurant so I felt really suaku when I saw the interior. We were seated at a long table specially arranged for us. My stomach grumbled while we waited. And then they said the event is starting. Evilbean's stomach smiled as well. I could hear it chanting: "Pizzas! Pizzas! Pizzas!" We were given a brief of what Domino's Pizza is and the career opportunities that are actually available right now. They are offering positions for 'Delivery Experts', 'Pizza Chefs' and Management. I can tell you that being a Pizza Chef is SUPER cool and fun. We were given a tour in the kitchen where we got our hands on making our very own pizza! It was an eye-opener for me to see the whole process of how the pizza is made. Now get ready for a barrage of pizza photos, because HERE COMES THE FOOODDDDD! Besides pizza, they also served us their sides, and in particular, a new side dish that I am gonna rave about. For a pizza franchise specialising in pizzas, their sides are pretty good. Of course, the onion rings or the chicken wings will not be the best that you have eaten but the standard is there. However, this new side from them might make it into the list of best meatballs you have ever eaten. YES. This is their Napolitana Baked Meatballs that is soaked in cheese and Napolitana sauce. I like my balls juicy and firm (AHEMs) and THIS IS EXACTLY HOW THEY DID IT. The ball is so beefed up that when you chew, you can feel the bounciness of this meatball - every single bite into the ball is pure meat and there is no sense of 'airiness' or emptiness in the ball. You know how sometimes you eat other kinds of meatball and when you chew on it, it feels empty and loose. This one is super shiok because it is firmly balled up. Evilbean had at least 5 of these firm, cheesy meatballs. After gorging ourselves with the food, we were then served with their piping hot lava cake. This is very 'gelat' if you eat this alone because they literally drowned their cake in lava. I could only eat for about 3 mouthful and the overwhelming sweetness of the chocolate got to me. Therefore, this lava cake is definitely meant for sharing. The last event for the day was the tour in the kitchen that I talked about earlier. Like I said, being a pizza chef for Domino's is super cool because not only do you get to learn how to make pizza, you will also be sent overseas for pizza-making competition! When I was in the kitchen, I was also really amazed by the lively atmosphere in the kitchen. The staff were having so much fun making the pizzas, it was almost as if that they were being paid for playing play-doh! and here comes the awesome part: a specially customised stainless steel Rolex watch for store managers who perform above targets and achieving outstanding performance through evaluation reports! WOW! ROLEX LEH. Not only that, they have various company events like chalets and bowling sessions for you to bond with each other if you work in Domino's so this is a really great company to work in. You can be sure of that because they received the 'HR Asia Best Companies to Work for in Asia 2013'. 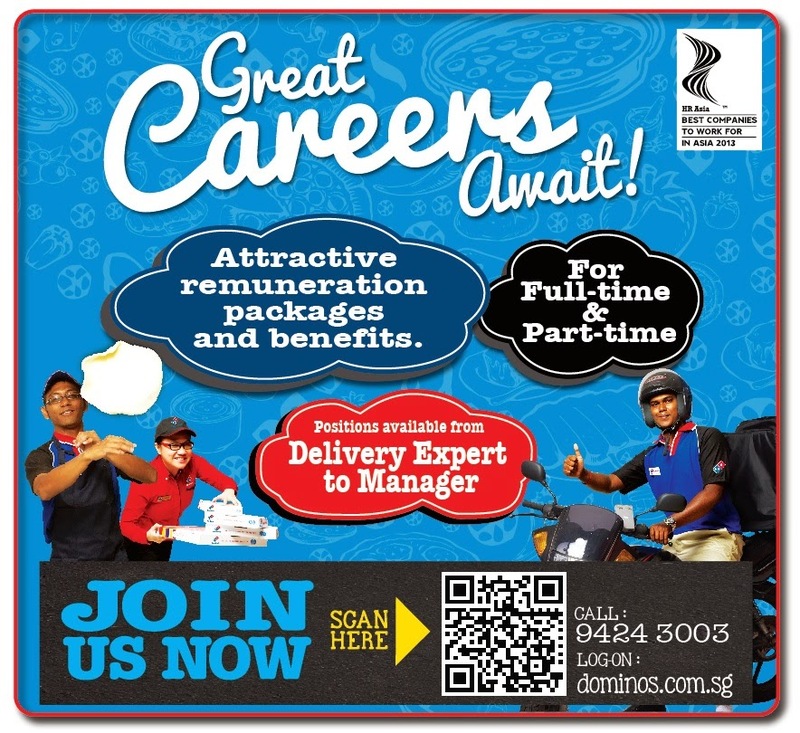 If you are looking for a non-boring job, you can be sure that Domino's will be one of your top choices to work for. For more details, scan the QR code below or call 9424 3003 for more details! I thoroughly enjoyed this event making new friends and making pizzas. Thank you once again @TheInfluencerNetwork and @Dominossg for the invite and the awesome food! I've been to every larger venue in the town and this is one of the best. Most of the negative elements of going to a more popular place are avoided here; the party planner was really mature and respectful.